Denmark Farm Eco Lodge01570 493358work Alternative AccommodationBuilt using sustainably sourced timber for the main frame, we have a biomass heating system using locally sourced wood pellet fuel. Rainwater and waste water run to a biodiversity-boosting wetland treatment system. Electricity is generated from our own PV solar panels. Sheep’s wool insulation enhances heat conservation and all is topped by a living green (sedum based) roof. All our beds are hand-made locally from FSC timber, with mattresses made from natural materials. Our bed linen and towels are 100% organic cotton and blankets are made from pure wool woven in a local mill. 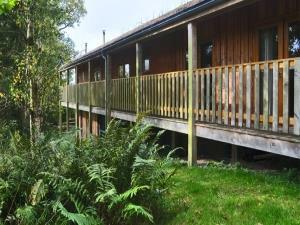 Each unit has its own wood burning stove to ensure a cosy stay for guests all year round. The Eco Lodge is set in a picturesque courtyard area which is also the setting for our training centre and offices. Guests have unlimited access to our wonderful 40 acre nature reserve with well marked trails, nature watching hides, ponds, lakes, meadows, woodland and wonderful wildlife garden. Two new features are our natural play areas for children; one is located next to the Eco Lodge and the other in a woodland setting next to the Eco Campsite. Please see our website for a range of workshops and activities which you can take part in during your stay. If you have your own ideas we will be delighted to help you organise a personal tailored activity for your stay. The Eco Lodge is made up of 6 bedrooms and 3 kitchen/living room spaces with a flexible internal layout allowing you to hire between 1 and 6 bedrooms to suit your needs. There are four twin rooms and two double rooms. (N.B. the doubles are situated at either end of the lodge and so it is only possible to hire two doubles when hiring the whole lodge). All bedrooms are en-suite except one which has a shower room nearby. Two of the living room areas have double sofa beds making the total number of beds in the Eco Lodge 16. Built using sustainably sourced timber for the main frame, we have a biomass heating system using locally sourced wood pellet fuel. Rainwater and waste water run to a biodiversity-boosting wetland treatment system. Electricity is generated from our own PV solar panels. Sheep’s wool insulation enhances heat conservation and all is topped by a living green (sedum based) roof. All our beds are hand-made locally from FSC timber, with mattresses made from natural materials. Our bed linen and towels are 100% organic cotton and blankets are made from pure wool woven in a local mill. Each unit has its own wood burning stove to ensure a cosy stay for guests all year round. Great Children welcome from any age. 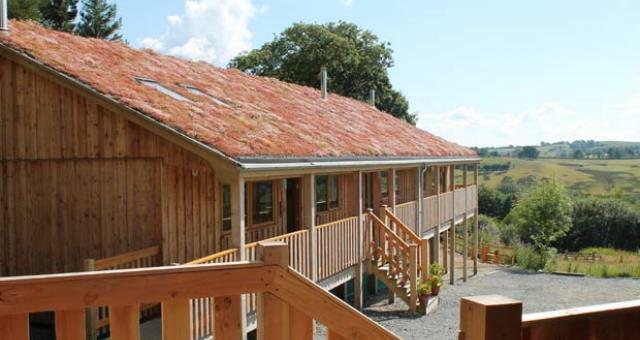 Denmark Farm is situated 4 miles from Lampeter in Ceredigion, mid Wales. (Grid Reference SN586537). If you are travelling from Lampeter on the A485, look out for our brown tourist sign and take the turning left (after a stone bridge). Alternatively, in the hamlet of Betws Bledrws, take the minor road opposite the chapel and the telephone box.